Description: I assembled a 10'000 x 5000 km area from 6 16-bit MOLA images, copied an area of around 4000 km square and created 4 4096 x 4096 tiles from it and used them as terrain. The better part of the day I needed to get fog and haze right. The camera is roughly on 90 deg east and 10 deg south about 80 km above the martian surface, looking east along the Valles Marineris. Below the camera, unseen, is Noctis Labarynthus. The near part of the Valles Marineris is called Ius Chasma, the middle part (after the "bulge") Coprates Chasma and in the fog is Eos Chasma, a bit to left of it Capri Chasma. Far in the background we see ranges of the Margaritifer Terra. In the middle ground at left, there is Candor Chasma and even more left, Ophir Chasma leading into Lunae Planum. In the foreground at right is Sinai Planum. The resolution of the MOLA used is around 460 m per pixel (1 m in height), that's why there are no vehicles. I added a bit of "Moonscape" bump to make the surface a bit more interesting. This is not correct, but neither completely wrong. 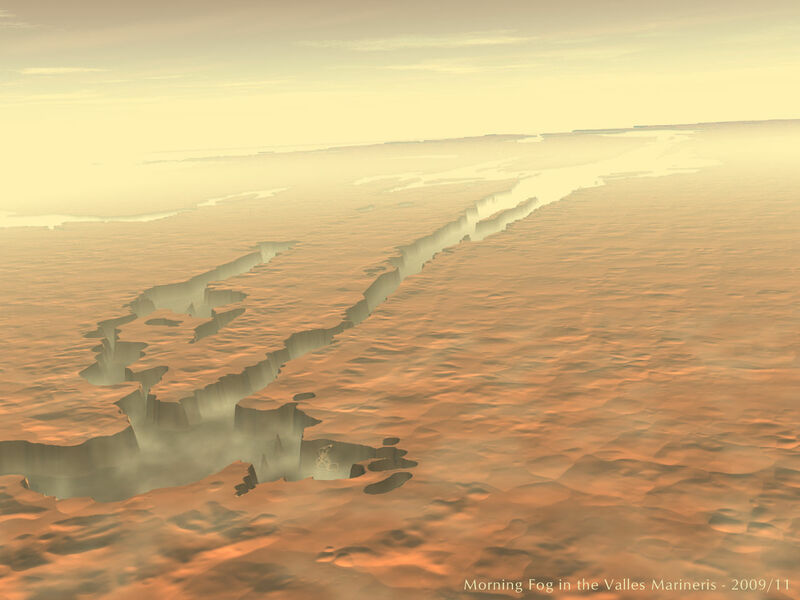 Though not yet proven, it is supposed that in the early morning, there might collect some fog in the depth of the 4000 m deep Valles Marineris. I was inspired by a painting by Steven Hobbs that appeared on the back of the November 2009 Planetary Report. Very alien looking. I would assume that water had been flowing on Mars to carve such channels. I really like this landscape. I can imagine ships ascending thru the fog. Looks like a great background for an adventure game! !